“The first segment of Interstate 11 is under construction on the north side of the Mike O’Callaghan-Pat Tillman Memorial Bridge over the Colorado River at Boulder City, Nevada. 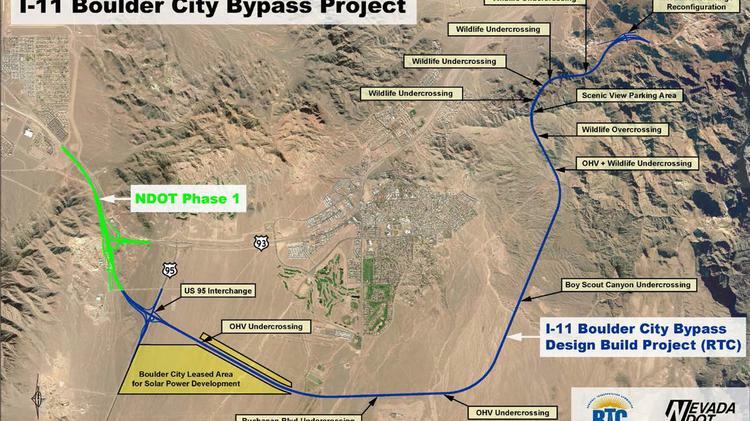 The $318 million, 15-mile segment of divided highway will bypass Boulder City and connect with U.S. 93 near Henderson, Nevada. The Nevada Department of Transportation broke ground on two segments: a 2.5-mile portion bypassing Boulder City for $83 million; and a $235 million, 12.5-mile segment funded by the Regional Transportation Commission of Southern Nevada.” Read the full article on the Phoenix Business Journal website. This new bypass project will make the drive from Phoenix to Las Vegas faster with the option to commute directly to Henderson! Copper Star Professional Transportation will benefit from this new highway by getting their valued clients to an exciting destination quicker with less drive time. Our company charters buses to accommodate large group for in-state and out-of-state travel. With Las Vegas being a top destination for Arizona residents, we are excited about the movement taking place on the interstate construction.